COMPANY PROFILE Andhra Bank is a commercial bank. The Company offers banking services and products including retail banking, corporate banking, NRI banking, credit card services, retail lending, and accident insurance-linked savings bank accounts. Andhra Bank is an Indian provider of banking products and services. The bank generates all revenue domestically. The bank operates through four segments: corporate/wholesale banking, retail banking, treasury, and other banking operations. The largest segment is corporate/wholesale banking, which offers working-capital finance, export and import loans, insurance, corporate loans, bridging loans, bank guarantees, forward contracts, agricultural loans, loan syndications, and finance for small and midsize enterprises. The retail banking segment offers products such as deposits, loans, debit cards, credit cards, insurance, mutual funds, and Internet banking. The Indian government is a shareholder of Andhra Bank. 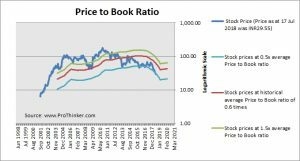 At the price of INR29.55 as at 17 Jul 2018, Andhra Bank is trading at a Price to Book Ratio of 0.3 times current book value. 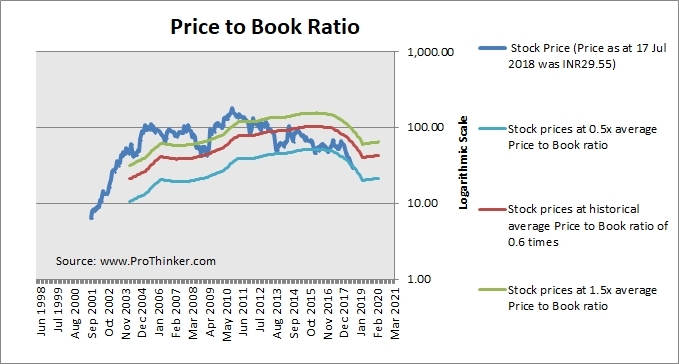 This is a 53% discount to its historical average Price to Book Ratio of 0.6 times.